Do you remember the last time you called your family or friends by typing in a phone number? Probably not, you just used the contact list. 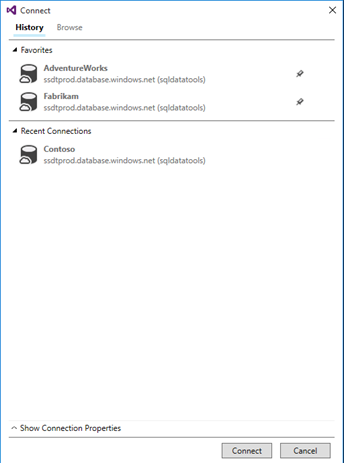 Why can't you connect to your database just like that? 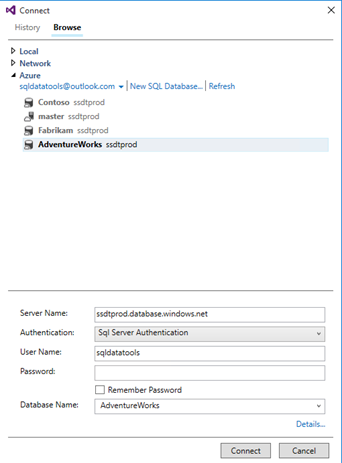 Today we are announcing an improved SQL connection experience in SQL Server Data Tools Preview for Visual Studio. With the new connection experience in SSDT, there's no more memorizing server and database names, writing them on your palm or a napkin, or switching apps to get the fully qualified server name. Simply connect using favorites, recent history or by browsing your Azure SQL Databases. Check out the new connection experience in action! Get the latest preview of SSDT here. Please comment below or send your feedback to SSDT Connect Feedback or find us on Twitter.